Celebrating the 4th of July holiday means fireworks, cookouts, swimming pools and of course, the inauguration of summer! We cannot think of a better way to wish Uncle Sam a happy birthday and reflect on the proud history of this nation. Put on your suntan oil, fire up the grill and get the drinks flowing while we list ten of our favorite facts from this explosive holiday. 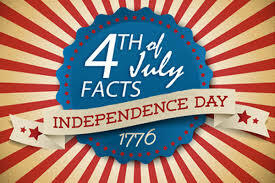 Fireworks were first authorized by Congress in July 1777. Over 14,000 fireworks displays take place across America. During the 19th century, cannons fired all-day salutes on the 4th. The color green represented the holiday until red, white and blue color paper became readily available. Nathan’s Famous Hot Dog eating contest has become a tradition on the 4th. In 1778, Benjamin Franklin celebrated the 4th in Paris with a party for expat Americans an elite French citizens. 90% of the fireworks industry revenue is generated on the 4th. For the professional display industry, it is 75%. 150 million hot dogs are consumed on this holiday. Over 74 million plan BBQ outings for the day. Americans spend over $203 million on condiments, such as ketchup and mustard. These are just some fun facts about our national holiday and how we celebrate. Many traditions have come and gone over the years, but we keep the true meaning of the celebrations close to our hearts. Let’s never forget the struggles and sacrifices our forefathers made to create this great nation with the stroke of John Hancock’s pen. While we’re celebrating America’s birthday, we also want to take this time to celebrate the contribution of data analytics that allows us to better understand the progress of our country and its future. From all of us at Data Ladder, we wish you and yours a safe and fun holiday!